Is specialty coffee in danger? According to an article in New York Times (check out: http://www.nytimes.com/2011/03/10/science/earth/10coffee.html), Arabica coffee bean crops – the highest-quality type of coffee beans marketed and consumed around the world, have been badly affected by climate changes in Colombia – the largest coffee bean exporter of the world second to Brazil – including increased temperatures and changes in rainfall and dry spells, and climate scientists speculate whether the climate changes are signs of global warming. In some farms in Colombia, Arabica bean production has drastically declined due to the weather conditions, says the report. A shortage in high-quality Arabica coffee beans and rising prices is seen in New York, and some retailers sharply lifted coffee prices since the middle of last year because of reduced supply and higher wholesale prices. 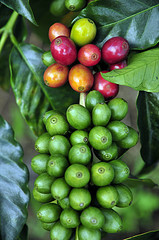 Arabica is one of the 2 main types of coffee beans consumed around the world. It’s the higher quality and more expensive one, and it is more sensitive to climate conditions and vulnerable to pests than Robusta that is of lower quality and higher caffeine content. Columbia is the largest Arabica coffee bean exporter second to Brazil. Last year production of Colombian Arabica beans was nine million 132-pound coffee bags, compared to 12 million in 2006 and visions to reach 17 million for 2014, according to the New York Times report. The coffee crops in the region are harmed by the higher temperatures that cause the coffee to ripen too quickly and bring about pests, plagues and diseases that damage the fruits. The Arabica beans are sensitive to weather conditions and even slight increases in temperature have a negative impact on the growths. Heavy rains and changes in dry spells also have a devastating affect on the beans. According to sources quoted in the NYT article, rain in Columbia was "more than 25 percent above average in the last few years." According to reports it's been a very difficult season for coffee beans in Colombia, and due to excess rains, wet weathers, lack of dry periods much needed for the harvest, and resulting leaf-rust fungus attacking the crop, production of Arabica coffee beans in Colombia in 2011 may be a total of about 8.5 million 60-kg (132 pounds) bags this year smallest in two years and this may further drive up prices of coffee in the US.